Not the original, of course — much of that was butchered and stolen by Lord Elgin 200 years ago and the rest remains in place under assault by Athenian pollution — but castings made from the original 19th century molds were rescued from the library of the Staten Island Academy in 1960 by two College of Staten Island professors. How the casts found their way to Staten Island remains something of a mystery. It is known, however, that the works were made by a Boston firm called P. P. Caproni & Brother that did work for East Coast museums and universities and that fashioned the casts from 19th-century British molds taken directly from the Parthenon. Somehow, the casts wound up in the library of the Staten Island Academy, a private school. William Winter, a New York theater critic, dedicated the library to his 13-year-old son, Arthur, who had died in a sledding accident in 1886. Because “Ivanhoe” had been the child’s favorite book, the school’s library had been decorated to replicate the frieze-adorned study of the book’s author, Sir Walter Scott. When the academy moved to Dongan Hills in 1970, the reliefs stayed behind in the abandoned school. The castings were somewhat neglected until recently, but now, thanks to the efforts of history professor Sandra Gambetti, they are being lovingly restored. 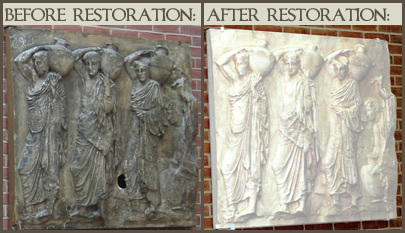 For more details and some fantastic pictures of the casts and restoration process, see The Parthenon at CSI.